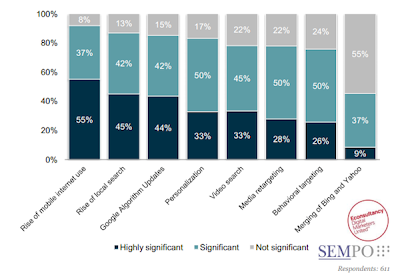 A new study shows that Google’s recent updates as well as the rising trend of the internet and local search have significantly impacted search marketers. According to the new SEMPO State of Search Marketing Report 2012, there are about nine out of 10 search marketers that have been significantly impacted by Google’s recent algorithm changes, and about the same amount have also been significantly impacted by the rise of the mobile internet and local search. The data from the State of Search Marketing Report 2012 was gathered by SEMPO, the world's largest nonprofit organization serving the search and digital marketing industry and marketing professionals, and was based on a global online survey of nearly 900 search marketers from 36 different countries, with about 64 percent being in the US, which was conducted online between March 12 and May 15, 2012. The complete 72 page research report was published by Econsultancy. In the survey findings, it was revealed that 47% of in-house/company respondents considered the rise of mobile internet use as highly significant for their search marketing strategies and additional 41% of them considered mobile as significant, with a total of 87% overall. 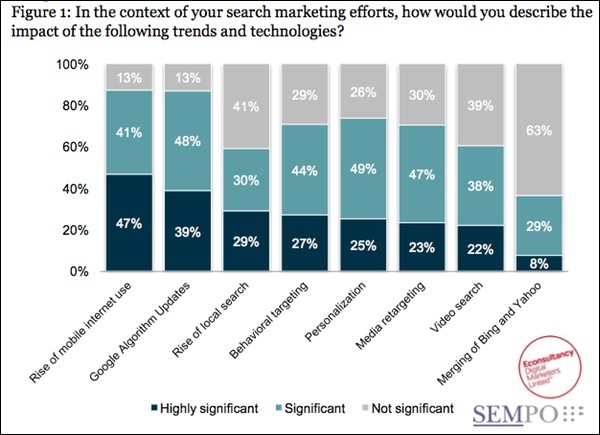 There were also 87% who also felt that Google algorithm updates were significant to their search marketing strategy, with 39% saying highly so. On the agency side, the numbers are similar, though they are more concerned with the rise of local search than Google algorithm changes. It was also revealed by the survey that 86 percent of all respondents are expecting their digital marketing budgets to grow and only four percent expecting a decline.